Japan will release Tokyo CPI YoY and the US will publish Natural Gas Storage, Prelim Wholesale Inventories m/m, Goods Trade Balance, Unemployment Claims, Durable Goods Orders m/m, and Core Durable Goods Orders m/m. 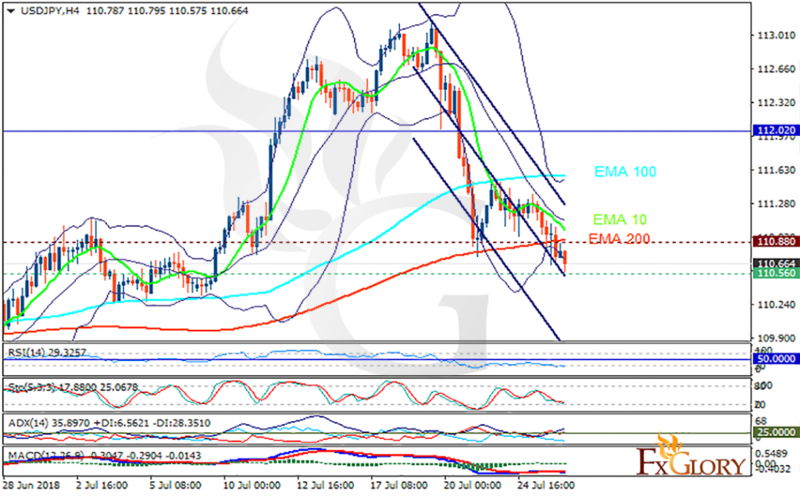 The support rests at 110.560 with resistance at 110.880 which both lines are below the weekly pivot point at 112.020. The EMA of 10 is moving with bearish bias in the descendant channel and it is above the EMA of 200 and below the EMA of 100. The RSI is moving in oversold area, the Stochastic is showing downward momentum and the MACD line is below the signal line in the negative territory. The ADX is showing strong sell signal. The price has already reached the lower Bollinger band, the correction pattern may start soon targeting 111.